Scientific Name(s): Liriodendron chinense (Hemsl.) Sarg. Although the species have been geographically separated for more than 10 million years they are still interfertile. They differ very little in form, the leaves of the American species being slightly larger and the Asian species lacking the orange colour found in the flowers of Liriodendron tulipifera. 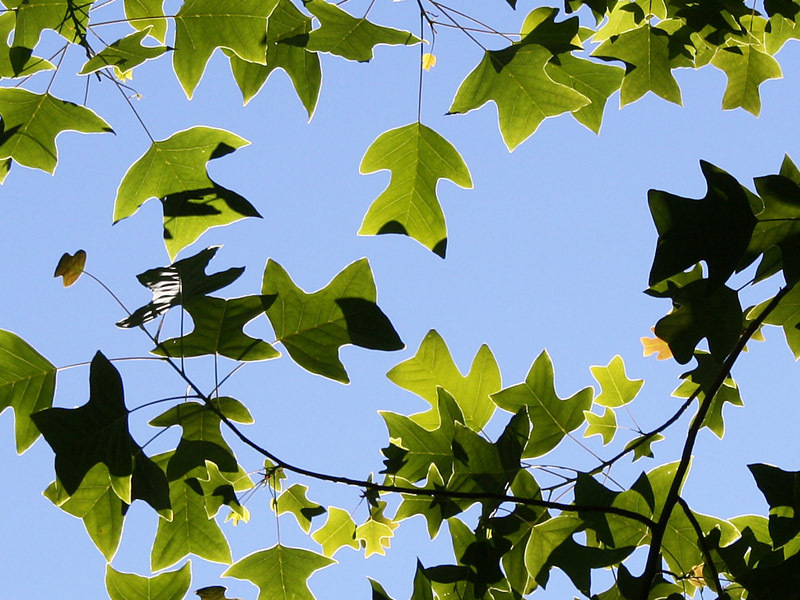 Liriodendron chinense is rare and endangered in its native habitat. It is grown for timber and as an ornamental tree. The leaf shape of Liriodendron is quite distinct and the similarity of its outline to the shape of a tulip flower gives rise to the common name, tulip tree, which refers to either species. I enjoyed photographing the leaves of this species back lit by evening sun–some lit–some shaded dark. They are in all stages of development turning each direction. A display to rival the flowers. This is a BEAUTIFUL tree and the leaves are unusual, like maples missing the tip. The flowers don’t last very long, so don’t plant one for the bloom. They do have good fall color most years. However, both L. tulipfera and L. chinense are LARGE trees and look odd if planted in a small landscape. Just a gorgeous photo showing what beauty is on offer when we look! In Georgia and elsewhere in the southeastern U.S., tulip poplars are important early-season sources of pollen for honeybees in backyard hives. Great photo. But what causes the beautiful white outline round the margins of the leaves? Is this just the clear epidermis without any chlorophyl? We had a L. tulipifera in a previous home some years ago. I especially loved it when the cedar waxwings would feed on the flower nectar for a week or so during their early summer migration. It was a wonderful summer shade tree that had beautiful fall color, too. This style of photography is one of my favorites. I love looking up during a hike to see what interesting combination of green leaves and sunlight is going on above me. Dana, thanks, I should have worded the sentence about the common name differently. The flowers do look superficially like tulips and the common name comes from this, but the leaves also lend themselves to the common name. The plant was shown to me this way. The outline of the leaves looks like an icon of a tulip flower–think of something you would see on a family crest. An image search for “tulip icon” brings up some images that illustrate this, but the links were too commercial for me to insert. Don, I don’t know what caused the white outlines. Makes me curious as well. I may have to take a closer look at a fresh leaf, if I can get a hold of one. These leaves are all quite high overhead. These trees are indeed beautiful and the flowers are lovely but this is not a tree that I would recommend for a suburban house lot. It grows very fast and so is susceptible to breakage from high winds. The seed pod is also unique and pretty but the pieces fly far from the trees and form a compact mass in house gutters. Just look at this tree from afar. I remember being told that the name came from the leaf shape. And it wasn’t Eric who told me. But Wikipedia cites a book from 1900 that claims it’s the flower shape. I found one reference that says “Leirion is Greek for a lily and dendron is a tree. The genus name and the specific epithet, tulipifera, tulip-bearing, refer to the shape of the flowers”. The Chinese species has a more dramatic leaf outline than the American. Two seedlings of the Chinese species, obtained from Colvos Creek nursery, Vashon, WA have grown vigorously on Camano Island. Tulip trees are lovely, but as stated above, they are best in a woodlot and far away from houses and utility lines. They grow straight up like telephone poles and get big incredibly quickly. 80 feet is not uncommon, and the spread and girth is similarly impressive, so one can imagine the havoc wreaked by one of these things toppling onto a house in high winds. Which, if you hike its native hills, you’ll find is far from uncommon. The roots and wood seem only able to support the tree to a certain size before any extra stress is too much. Plus the petals from the teacup-sized flowers create litter in the spring and the seed capsules (similar in size and structure to magnolia pods) create litter in the summer and the (did I mention HUGE) leaves create litter in the fall, so lots of cleanup involved with this tree in a yard. But if you have acreage and want a big, beautiful impressive tree in your woodlot to house squirrels and feed birds and bees and provide mulch litter for wildflowers and invertebrates, this is your ticket. How wonderful to know our L. tulipifera has an Asian counterpart. More proof of the ancient connection of the two continents. Recent research into its genome has shown that L. tulipifera has not changed in millions and millions of years. I think it just thought it was perfect, and has stayed that way. In Ontario, in Toronto, tuliptree is a valued tall canopy street tree, along with silver and sugar maple, and other large trees. We don’t mind falling petals or leaves. The Morris Arboretum in Philadephia has a putative hybrid between L. chinense and L. tupilifera . Vigourous plant .Taxonomic authorities from England of late have seperated the Liriodenron from the Magnoliacea and now considered them to be of their own family , Liriodendracea , even though they are closely related to the Magnolia’s.